Today we have a guest post from Julian from Debt.org, a debt consolidation company. I have not worked with the company but they have good informational articles on their site and they offered to share a few words on a topic close to any student’s heart this fall, student loans. Check it out. The exploding cost of getting a college degree is making it nearly impossible for students to go to school without getting some sort of financial aid that includes a loan. The amount of debt students have after finishing four years at a university (latest figures estimate about $35,000) has some people reconsidering their choice to take out student loans. Some people would look at those numbers and declare student loans not worth it at all, but many statistics do show that having a college degree in the United States can nearly double your potential annual earnings. In 2010 the median salary for workers ages 25 to 34 with a bachelor’s degree was $45,000, according to The National Center for Education Statistics. Meanwhile, the same study found the median salary for those with a high school diploma was $29,000. Salaries fell to $21,000 for workers without a diploma. So what does that have to do with student loans? It comes down to whether you think the risk of the investment is worth the reward. Financial experts recommend that borrowers be careful about their choices. If you’re going to borrow thousands upon thousands of dollars in student loans, it’s probably best to make sure you choose a career with a higher earning potential. Degrees in engineering, technology, mathematics and nursing traditionally pay more. Another factor to consider is the possibility of getting a two-year degree. After adding food and housing, books and supplies, transportation and other miscellaneous basic expenses, the total budget for a student attending a public two-year college averages close to $15,000, according to The College Board. Earlier this year, researchers at Georgetown University found that nearly 30 percent of people with associate’s degrees make more right out of school than people with a bachelor’s. Statistics from The U.S. Bureau of Labor finds that in 2010 there are 80 occupations that don’t require a bachelor’s degree that have median annual salary over $50,000 or higher. It may be beneficial to ask an air traffic controller making six figures a year, if the amount they spent on their associate’s degree was worth it. Hopefully, those figures will give you some perspective on where taking out loans for an education may lead. 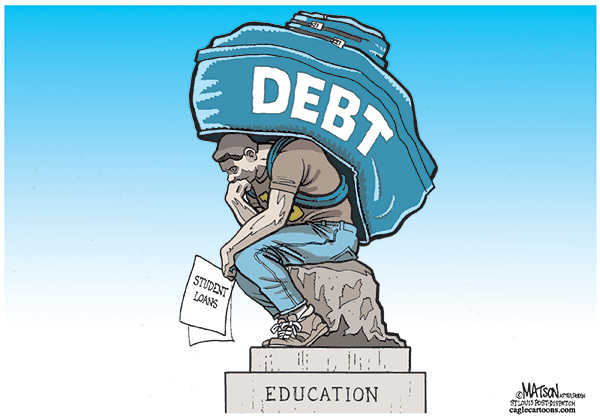 You’ll have to answer for yourself whether you think student loans may be the key to a better life, or a too-expensive financial burden that may weigh you down for years to come.